Two longtime trustees have completed their terms on the board. 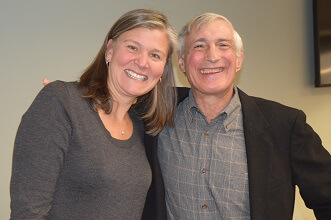 Jennifer Atler Fischer and Rob Klugman bid the board farewell at its December meeting. Both trustees served on the board for 10 years. Atler Fischer is a past chair of the board and, in addition to serving on the Health and Jewish Life committees, she helped lead the inaugural year of Innovate for Good in 2015. Her fellow board members remember her focus on this unique initiative for the Foundation, as well as her work to expand the charge of the Health committee beyond physical health. Atler Fischer remembered the polite but firm declination of a grant she’d received from the Foundation when she was the young head of a nonprofit called Invest in Kids. “I have grown up here,” she said. Klugman has served on the Jewish Life and Education committees and his fellow board members remembered him as a colleague willing to ask difficult questions and who cared to get things right. Lisa Farber Miller, senior program officer for Jewish Life, offered five lessons she has learned from Klugman over the years working with him. They include being strategic, being prepared, committing to inclusiveness and having resilience and fortitude. Both Atler Fischer and Klugman and will continue to serve on Foundation committees – Atler Fischer on Aging and Klugman on Education and Jewish Life.